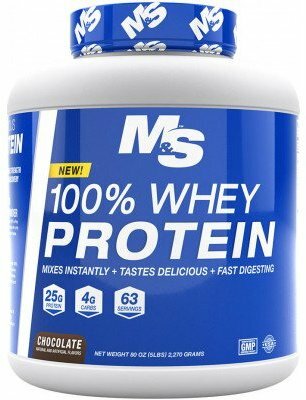 Whey Protein Concentrate, Cocoa Powder, Whey Protein Isolate, Natural and Artificial Flavors, Xanthan Gum, Carrageenan, Stevia, Hydrolyzed Whey Protein, Salt, Sucralose. Whey Protein Concentrate, Whey Protein Isolate, Natural and Artificial Flavors, Xanthan Gum, Carrageenan, Stevia, Hydrolyzed Whey Protein, Salt, Sucralose. Muscle & Strength 100% Whey Protein is a premium-quality fast-digesting protein powder formulated to support any muscle building, fat loss or fitness program. * Made with only the purest 100% whey protein from the USA, each scoop delivers 25g of bioavailable protein and 5,685mg of Amino Acids with only 140 calories. In addition to the unbeatable nutritional profile, Muscle & Strength 100% Whey Protein tastes incredible and mixes effortlessly. Muscle & Strength 100% Whey Protein tastes incredible, thanks to rigorous testing and development. It has a rich and creamy taste you'll love by itself or mixed with other foods. Muscle & Strength 100% Whey Protein is 100% instantized, meaning that it mixes effortlessly with any beverage. There is no clumping or gritty chalk-like taste found with other protein brands. Muscle & Strength products offer unsurpassed quality, performance and affordability. Each product is rigorously tested for purity and potency. We offer a full money-back guarantee if you're not completely satisfied.